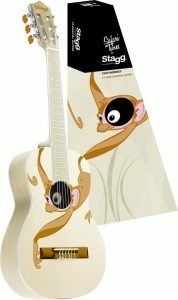 Whether you are looking for an electric or nylon string guitar for your toddler, we have come up with a list of some of the most popular options. Since toddlers are generally aged around 1 to 3, what you want to look for in a guitar for that age is a bit different than what you would look for in a guitar for an older child. The most important consideration when shopping for an instrument for a toddler will be the size of the guitar. For the most part, you should look for a guitar that 1/4 size, which means that it is a 1/4 the size of a regular guitar. After size, I would look for a model that is durable and will be able to take a little bit of a beating from your child, since it is going to be challenging to teach them how to care for an expensive more delicate model. If you don’t want to spend too much money and want a basic kids starter guitar, you should have a look at some of the First Act Discovery guitars that are available. They are toy guitars that don’t have the best sound quality, but they come in lots of bright kid-friendly colors with characters that kids love. First Act Discovery children’s guitars come in either a six string or a four string option. For a toddler, you will probably want to look at their four string models because they will be smaller and more manageable for your child to hold. Learn more here. Loog guitars are beautiful, nicely constructed, high-quality small guitars that are designed for kids as young as three to be easy to play. They only have three strings, so kids won’t get overwhelmed with trying to figure out how to play six strings. The other great thing about these guitars is the neck is very slim, so it is easy for kids to move their fingers around and play cords. It is similar in size to a ukulele, but it tuned in standard guitar tuning, so it sounds like a regular guitar. The Loog Mini guitar comes with flash cards and an app that helps kids learn to play. If you are looking for a serious guitar that is a little higher quality, a popular option is the Cordoba C1M. The C1M is a replacement for the very popular Protégé C1 by Cordoba. It is higher end 1/4 size design; it is light and has a lovely rosette that adds to the look of the guitar. Be aware that it isn’t cheap, it usually falls somewhere in the $140-$160 price range, so I would only consider this guitar if you or your child is very serious about learning and can take care of it. Learn more. 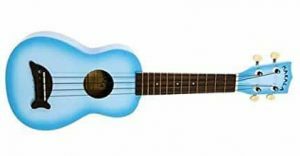 If you want something small and kind of fun to play, you may want to consider a ukulele. 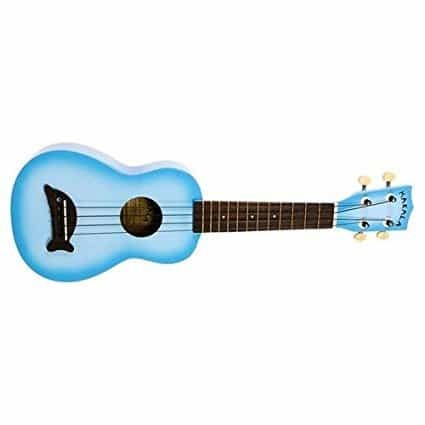 Ukuleles are a great starter instrument since they are very small and light and pretty easy to learn to play. Once your child has learned to play the uke, they can move up to a guitar when they are ready. You can usually get a good one for around $50. Makala has a nice one for kids that you may want to check out. Learn more. Lucida LG-510-1/4 Student Classical Guitar is a decent quality instrument for the price (around $100). It has nylon strings and should be fine for most toddlers to be able to hold. It is not a toy guitar, so some supervision will probably be needed when your child is playing with it. Learn more. The Stagg C505 1/4-Size Nylon String Classical Guitar is very similar in price and quality to the Lucida that is mentioned above. It is the small quarter size, so it is a good size for really small kids. The other great this about this model is that it comes in a few different bright colors (some with a cool painted design) that will appeal to kids. Learn more. Good toddler sized electric guitars are tough to find. 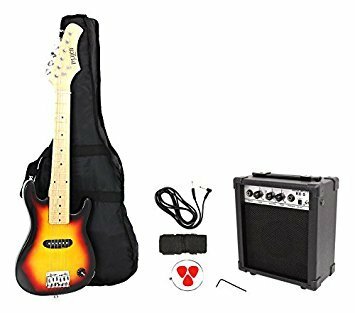 If you are set on getting a small-sized electric guitar for your toddler, you could try the D’Luca Kids 30 Inches Electric Guitar Package 1/4 Size; I haven’t personally seen or tried this model so I can’t comment on quality. The reviews seem to be okay. It comes in pink, blue, sunburst or black. Learn more. Unfortunately, there isn’t a huge selection of 1/4 sized electric guitars available that are a decent quality that works well for kids. If your child is older than three or they are big for their age, you may be able to go up in size to the half-sized guitars like the half size SX RST 3TS Package. The SX RST 3TS is a decent option for kids. You have to be careful with electric guitars because they are heavier than classical guitars. If you end up getting a model that is too heavy, it will be tough for your child to play it.